The days are lengthening; the nights are warmer — it’s time to start thinking summer. From white curtains billowing in the breeze, sleeping porches, shell collections and wildflowers to fresh juice in the morning and nautical stripes, certain things just beg to be a part of your summer routine. Here are 15 fun, crafty and creative ways to get your home in the spirit of summer. Hang outdoor curtains. What says summer more clearly than white curtains billowing in a breeze? And as if the tropical-vacation vibe weren’t enough reason to add them to your porch ASAP, they also provide shade and privacy. Collect shells in a big glass vase. 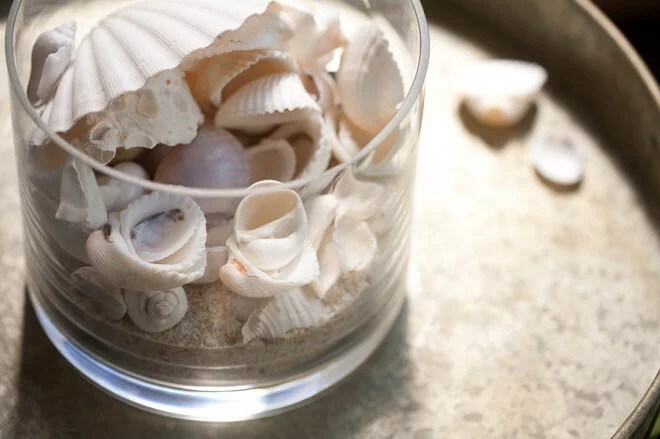 Start the season by filling a big glass cylindrical vase partway with sand, and gradually add shells as you find them on your beach adventures throughout the summer. Deck out your deck for siestas and fiestas. 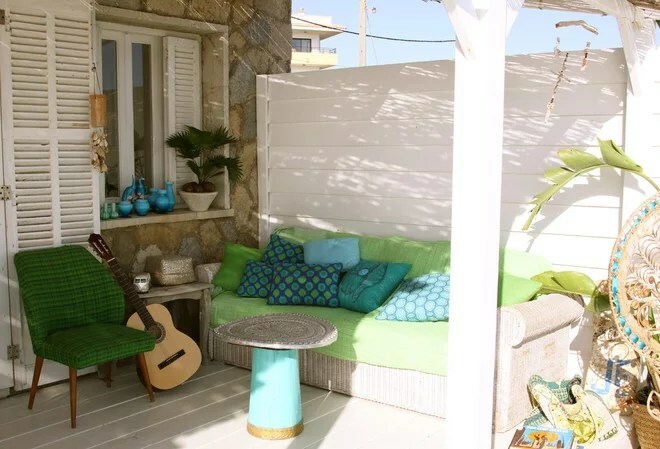 Colorful cushions, a pottery collection and a guitar set the stage for any relaxed afternoon activity you like, from solo napping to having a mellow party with friends. Set up a summery bar. 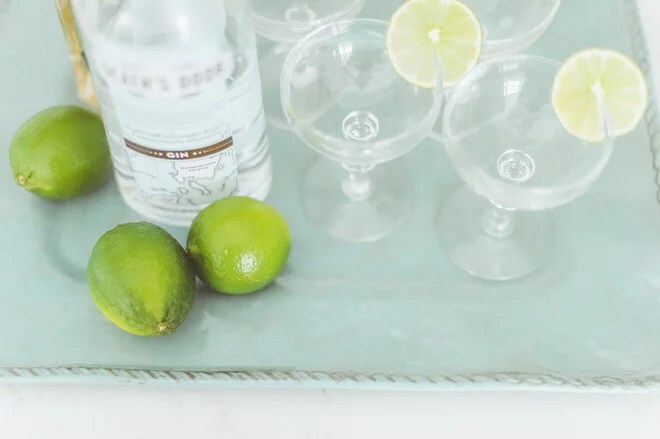 A pretty tray with a few glasses and a pile of limes is all you need to be ready for summer drinks — and the glasses don’t even need to be made of glass if your bar is outdoors. 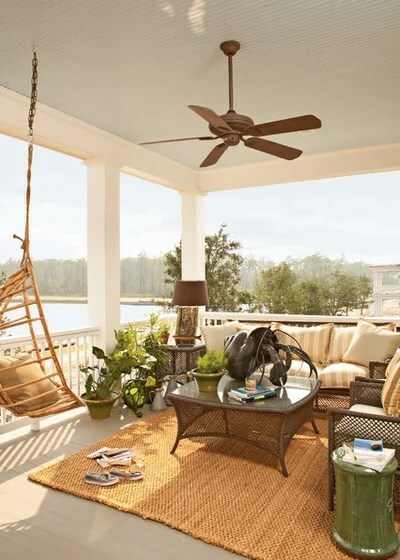 Hang a swinging chair.Whether outdoors or in, a swinging chair instantly makes any space feel more relaxed. Try one on the porch or in the living room. 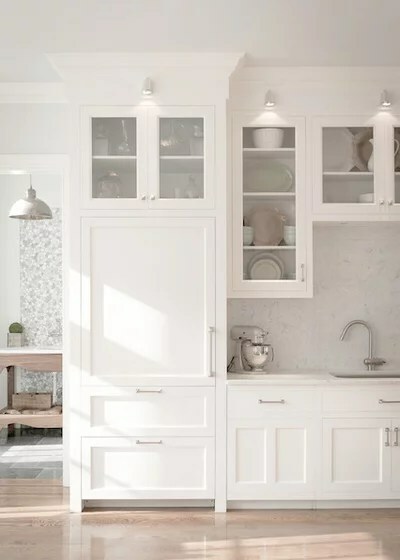 Restyle your kitchen shelves.Give yourself the gift of simplicity this summer by offloading the clutter from your kitchen cabinets into a few boxes and putting them away in a distant closet. 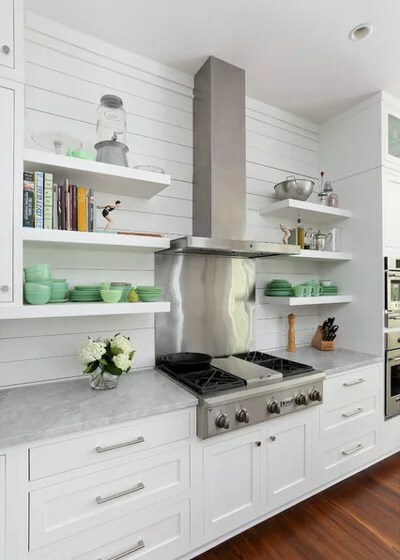 The extra breathing space will make it feel like you’re cooking in a vacation home. Decorate with driftwood. Found a cool chunk of driftwood on the beach? 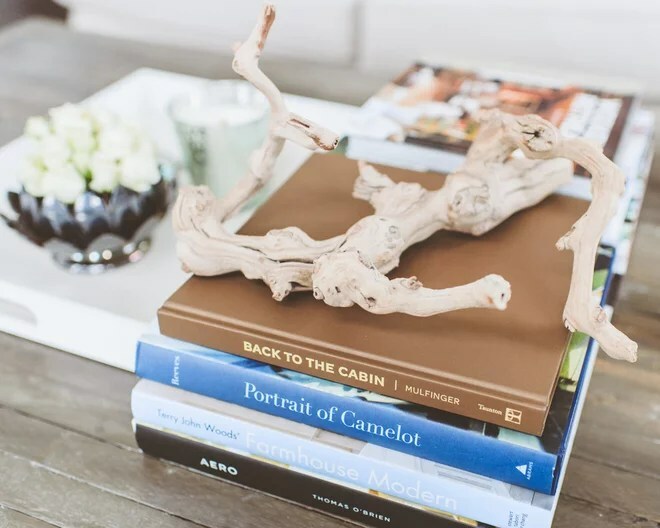 Clean it up and put it to work on your coffee table, console or bookcase. Make setting the table easy as pie. Instead of keeping your silverware in the drawer as usual, try storing it in a caddy right on the dining table for the summer months — plus it’ll be easy to grab when you decide to have dinner al fresco. Put some wildflowers in a jelly jar. When outdoor blooms are so plentiful, why buy them in a store? Snip whatever happens to be growing in your own backyard and plunk the stems in a jelly jar to add a romantic touch to any room. 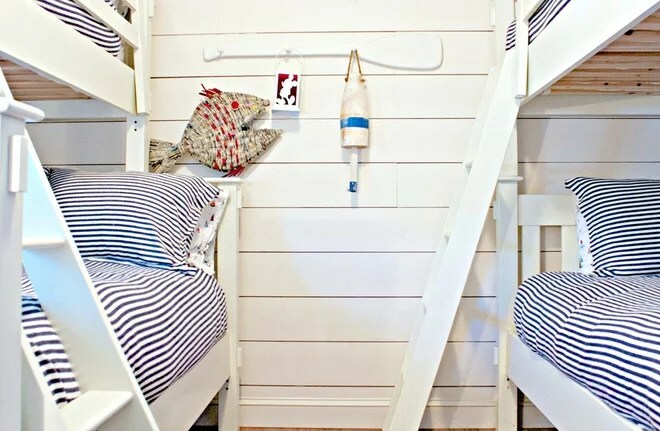 Freshen up the beds with crisp nautical stripes. Blue and white striped bedding on all of the beds feels very beach house chic. Shop around and scoop some up on sale. Keep rolled-up beach towels by the door. 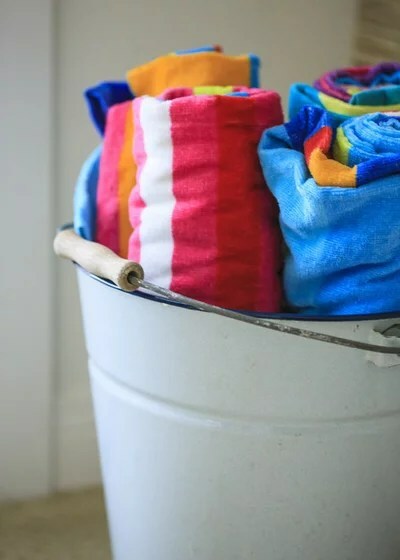 The bright colors look cheerful, and having the towels close at hand means you won’t have to scramble when it’s time to head out the door. Try storing them in a vintage enamel bucket, big beach tote or French market basket. Squeeze fresh juice in the morning. 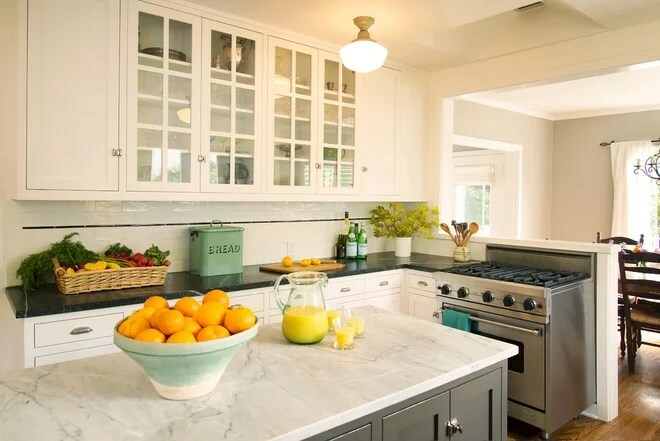 Keep a big pile of fresh oranges, a glass pitcher and a juicer together on the counter and make a ritual of squeezing fresh juice each summer morning. It’ll make the day feel special right from the beginning. Set up an outdoor changing area. 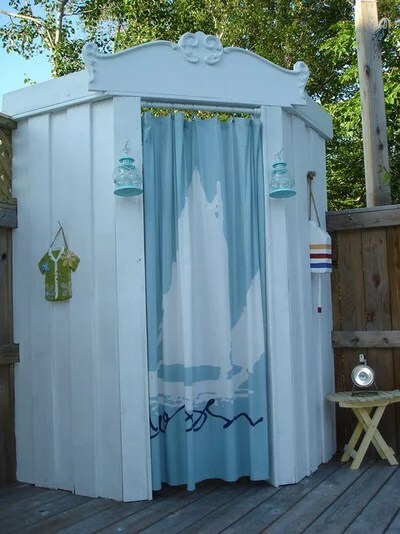 If you have a pool in the backyard or make frequent trips to the beach, it can come in quite handy to have a changing booth outside for getting into and out of bathing suits. 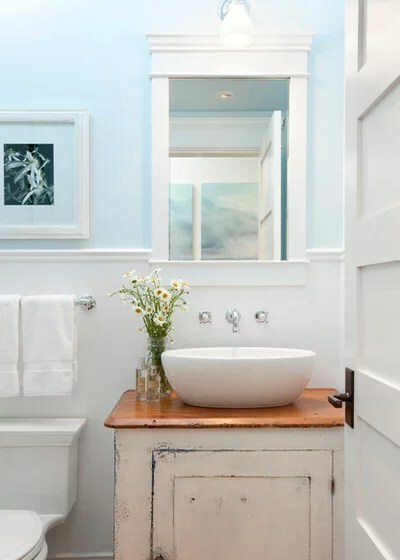 The one shown here has the charm of a vintage seaside cabana — style up your own changing area with old buoys, colorful lanterns and a fun, seaside-themed shower curtain. Furnish a sleeping porch. 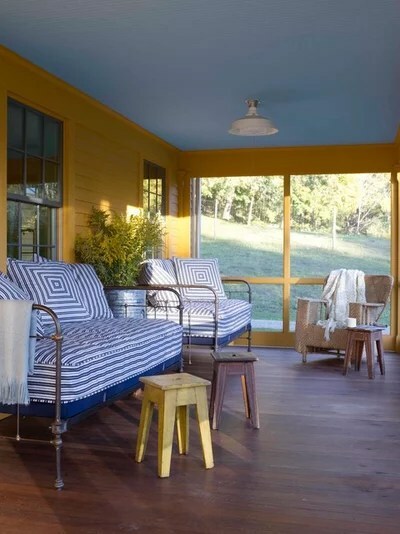 Add a daybed or two to your screened-in porch to transform it into an extra sleeping spot on warm summer nights — or a napping place on lazy summer afternoons, with a tall sweet tea in arm’s reach. You can’t beat an iron-frame bed and a striped mattress cover for classic summer appeal. Hang a flag. Hanging a flag can add vibrant color and style to your entry all summer long, not just on the Fourth of July. On a walk through any town in Britain and many in the U.S. and elsewhere, you could encounter homes from the Georgian, Tudor and Edwardian eras, to name just three. It can often be difficult to distinguish one period from another. Victorian architecture makes up a large proportion of those buildings. 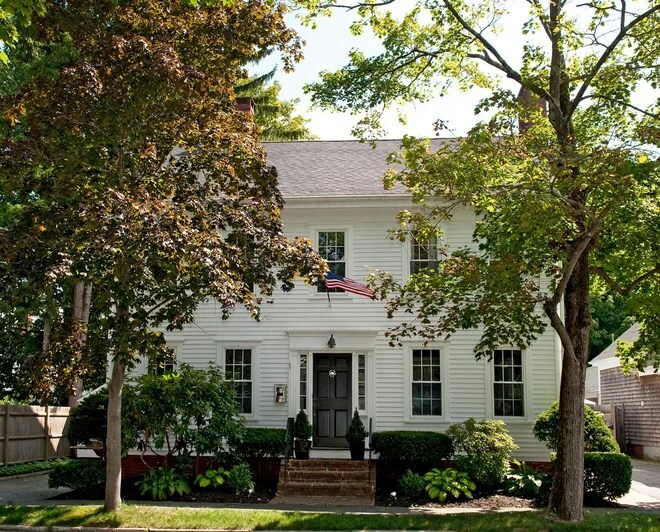 Here’s how to distinguish Victorian homes from the rest, and the design elements that make up their distinctive style today. 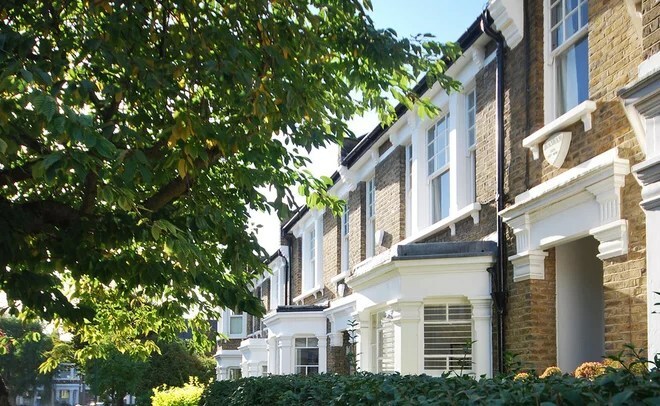 Main type: Terraced housing, generally built to accommodate workers moving to cities to work in factoriesThe Victorian era is the period in which Queen Victoria ruled Britain, from 1837 to 1901. Following the industrial revolution, which began around 1760 and lasted until about 1840, production methods and manufacturing processes had changed greatly. The beginning of the railways meant that building materials that would previously only have been available to those in the local area were now available countrywide.People flocked to the towns looking for work. 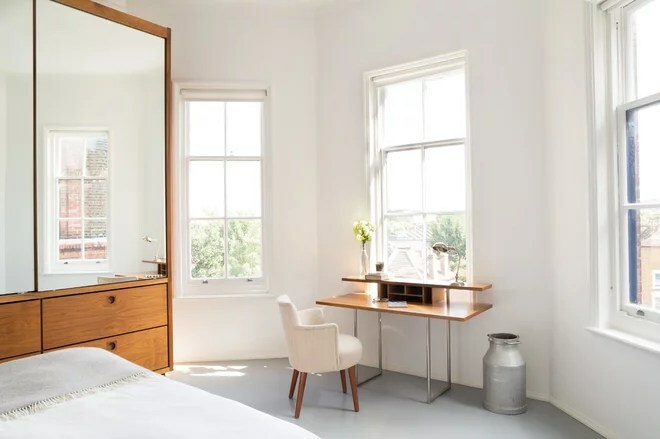 “The explosion of the property market happened in the Victorian era, so they were forced to mass produce homes to accommodate all of the workers,” says Hugo Tugman of Architect Your Home. A small, hidden kitchen. Kitchens were considered to be the territory of servants for the wealthy, and would certainly not have been on display to the public in smaller homes. Beyond the main house traditionally was a rear projection, or outrigger, which housed the kitchen, the pantry and, historically, an outside toilet.“The only rooms to be presented to the public were the formal reception rooms. 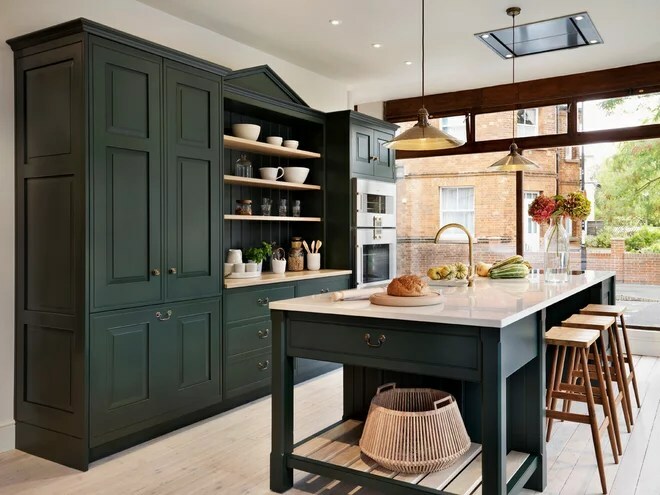 That’s probably one of the biggest differences between an original Victorian property built in the 19th century and one now: things like cooking were certainly not something on show to friends and guests,” says Martyn Clarke of Martyn Clarke Architecture. The rear projections were often more than 20 feet long, and can be extended sideways today to create around 430 square feet of space. No garage. Cars were invented toward the end of the Victorian era, so Victorian homes do not have garages, hence the multitude of properties today with only street parking. People traveled by foot, steam train, horse, horse-drawn bus and, in the case of the wealthy, horse and cart. Sash and bay windows. Plate glass — allowing for larger panes than were previously possible — arrived in 1832. Typical Victorian windows are made up of four or six panes fixed to wooden runners that slide vertically, called sash windows. Floor tiles. 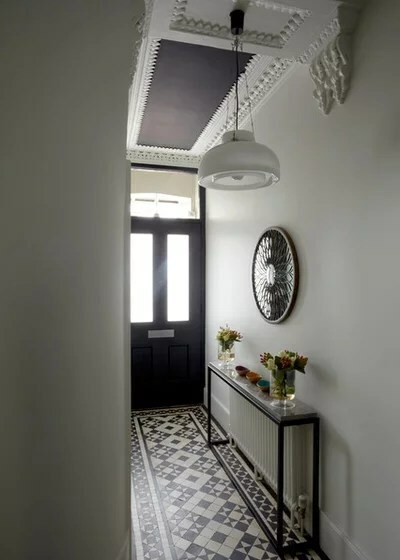 Victorian homes often have floor tiles in the porch area and hallway. Terra-cotta is a common color, as are black and white. Geometric patterns, such as this one, are typical. Porches. Victorian buildings typically have a front porch marking the main entrance. Their features vary depending on the grandness of the property. Small terraced houses typically have a small sheltered area, while grander properties have steps, gables and carvings around the porch. Molding. The quality of woodwork and molding traditionally was directly related to the status of the house. Molding gives form and shape to a room and is an important element in Victorian interior design. Grander homes have much more elaborate molding with decorative details, including ornate coving and ceiling medallions, designed to catch the smoke rising from gaslights. “You can have different grades of fireplace, different levels of cornicing — different levels of embellishment across the board,” says Clarke. The Victorian terrace. 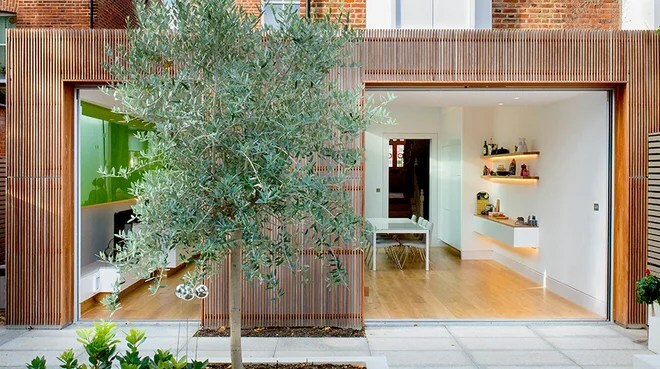 The terrace houses designed for working families are often very small and in close proximity to one another. A typical house of this kind is a two-up, two-down (two rooms upstairs and two downstairs). Sometimes a whole street would share just a few toilets. Some families may have had as many as 12 children — a source of income at the time, because they could be sent to work — so space is often extremely tight. Despite their compact footprint, Victorian homes are characteristically well proportioned, making them comfortable living spaces. “They have the best-proportioned spaces, with high ceilings and great depth,” Clarke says. The Victorian semidetached.Members of the emerging middle class lived in larger terraced and semidetached houses, just streets away from the more crowded homes of the working class. 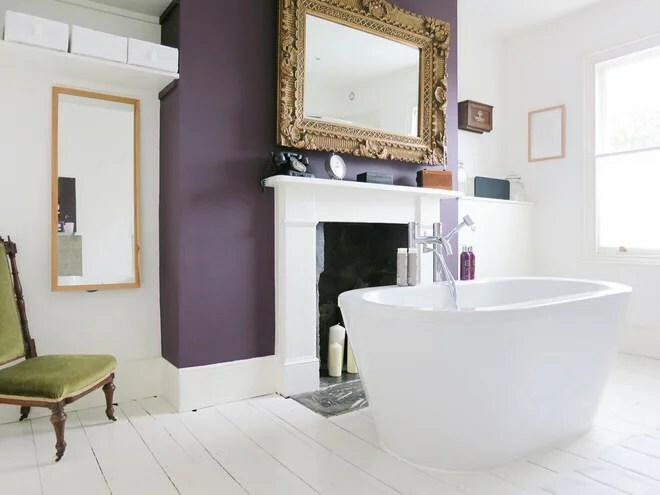 These homes are more likely to have flushing toilets and servants’ quarters in the loft or basement, depending on the status of the original owners. Their internal finishes are more elaborate, particularly in the public rooms. The Victorian mansion. For the wealthy, Victorian mansions traditionally were places of refuge and comfort. 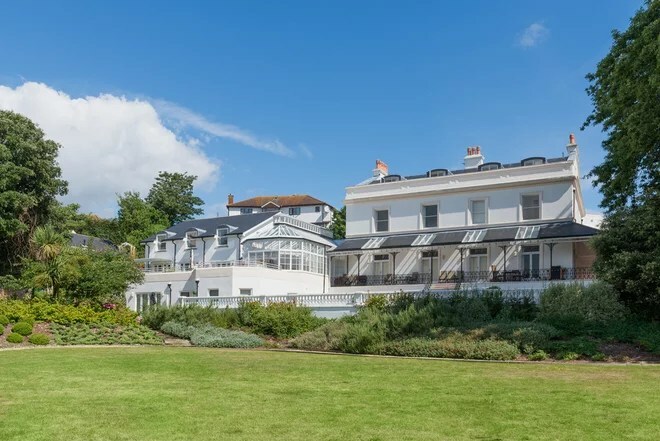 These homes are very grand and followed all of the latest fashions when they were built, including heavy curtains, flowery wallpaper and extravagant furniture. Rich, dark colors were à la mode back then, as were button-backed armchairs, ottomans and chaise longues. “Often they had riotous colors, and they embraced color much more than we readily give them credit for,” says Tugman. Servants once lived downstairs and were responsible for cooking and cleaning, lighting the fires, heating water for washing and helping members of the family to dress. Victorian homes today. Victorian architecture shapes much of our architectural landscape today. 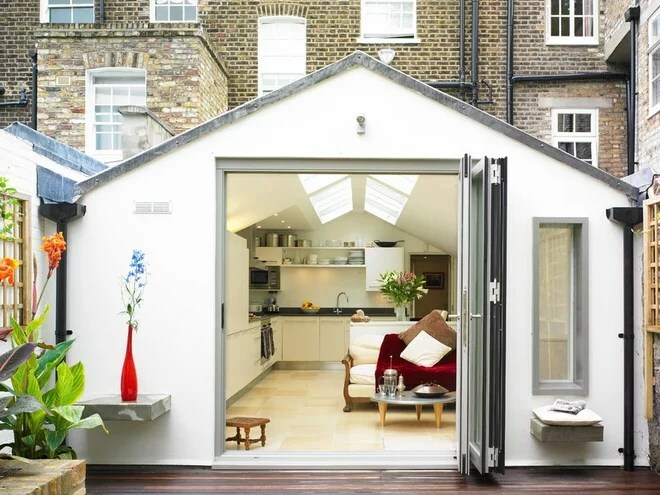 Many of the larger homes have been subdivided into apartments, and extensions have often been added to both large and small homes to make the most of the space. 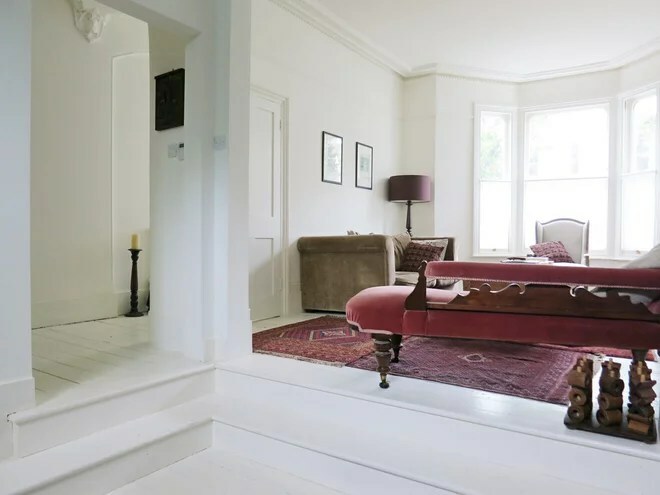 There are numerous ways to update Victorian homes: “You can add a contemporary extension, lay underfloor heating and renew sash windows,” for instance, says Clarke. But while many Victorian homes have been brought into the 21st century, many aspects of their history and character endure. 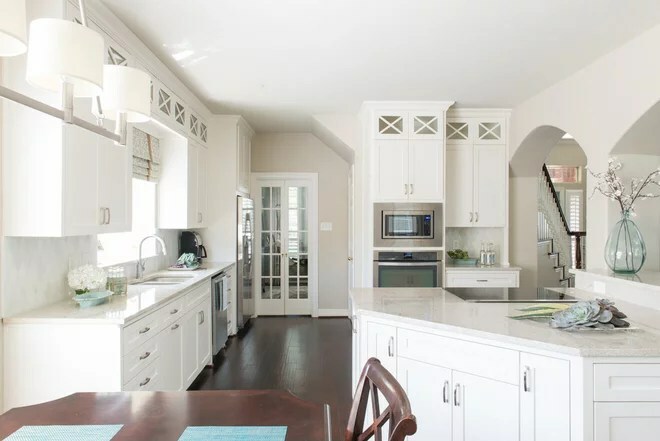 “Farmhouse” may imply a casual and informal home style, but farmhouse architecture developed through astute observation of details and an appreciation of pure form. 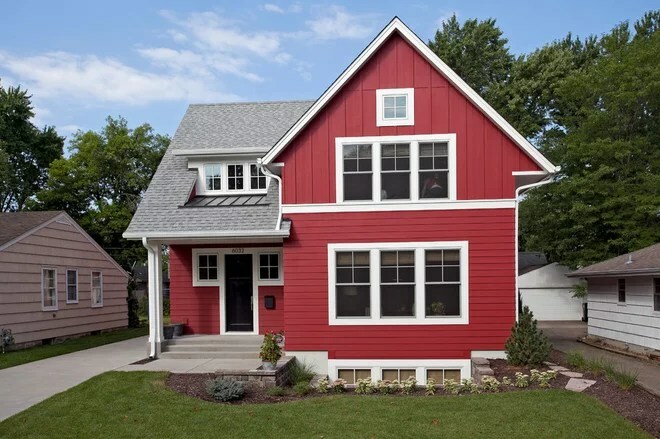 As a homage to regional building techniques, farm structures and folk interpretations of pre-railroad, national and Victorian styles, this American vernacular style has garnered steady admiration and has been replicated since the 1930s. 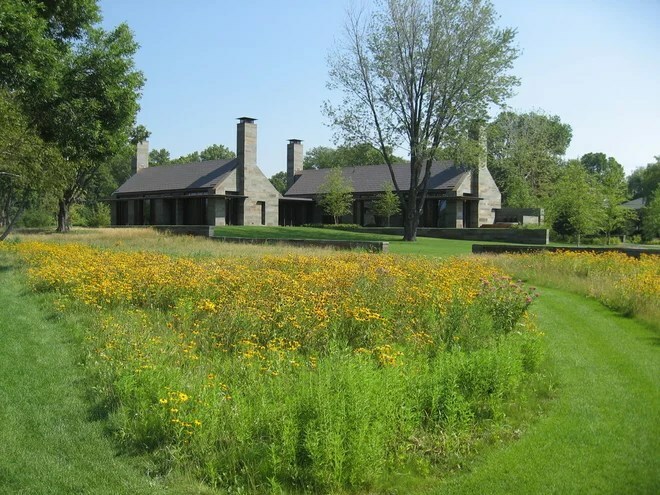 Today’s farmhouses can be and feel traditional or modern through the expression of their materials. 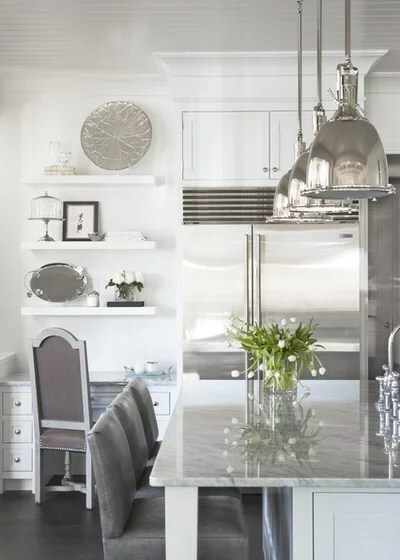 What sets this style apart from other home styles is that it always pays tribute to local precedent and interprets those qualities in a minimalist fashion. Here are some of its elements and expressions. Side gables. Variations on roof configuration in American vernacular are many. Most are simpler, as this is the nature of the style. This house is side gabled. Gabled dormerspenetrate the eave line for the second floor, and a shed roof creates the porch, but the main gabled roof dominates. In this example the primary structure is rectangular, but appendages extend to the sides, making a contemporary plan. Notice the simplified details. The porch posts and balusters of the railing are unadorned square supports. A simple molding wraps the top of the posts to imply a capital. The rafter tails are left exposed, which adds rhythm to the theme and echoes the repetition of the porch railing. 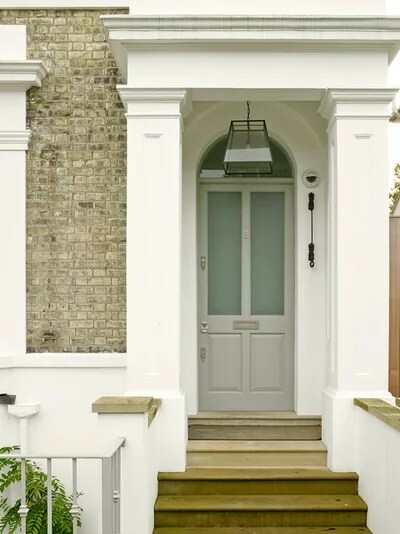 Shutters and a classically referenced entrance door contribute to the more traditional feeling of this house. Front gables. 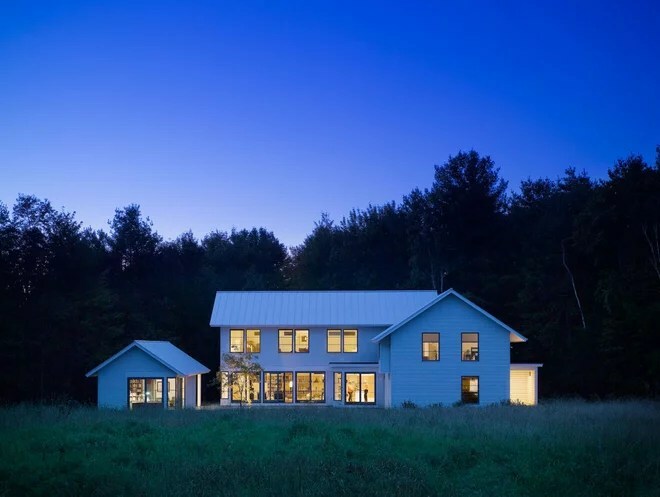 This rural New England front-gabled house respects the scale of its precedents. 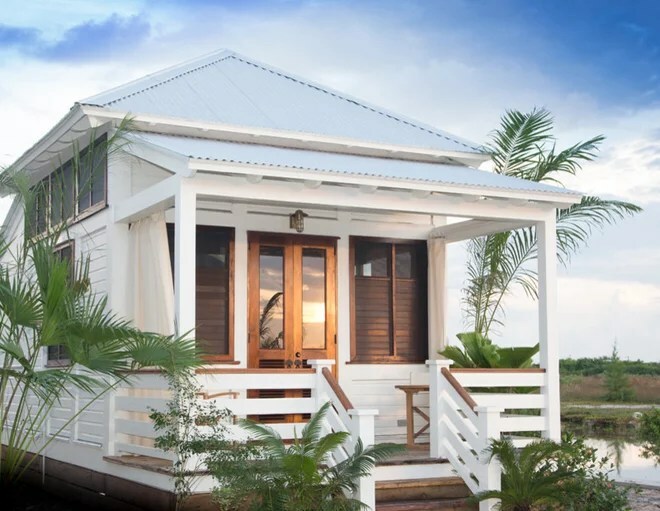 The tall two-story design is brought to human scale by the front porch with its shed roof. A shed roof shades windows on the right side and breaks up the height of that elevation. Unusual for the style, a hip roof covers the extension of the first-level portion to the left. Simple and square trim in contrasting white tailors the aesthetics of this design. Note the simplified porch post brackets, which pleasantly allude to structural supports found in regional designs. Cross gables. When two gables extend to face opposing directions, you have a cross gable. The roof of this house plays off the folk Victorian style that developed around the turn of the 20th century. Simpler in decoration, those houses maintained the massing familiar to more specific Victorian architecture. In this example the relatively simple use of a decorative truss fretwork establishes its identity. Notice the use of wooden brackets under the eave corners and the turned wooden porch posts. Other detailing has slight classical references, such as the window trim. The overall impression is similar to that of Midwestern farmhouses that have populated rural landscapes for nearly a century. Gables atop hip roofs. Less common but quite distinguishable is the gable on a hip roof, like this example. Though the two roof forms can have the same pitch, the gable is steeper than the hip here. As well, the gable portion gets pierced with a shed dormer. Double-hung windows refer to historical precedent. The dance between contemporary and traditional, as this house demonstrates, defines more sophisticated examples of American vernacular. Complex roof forms. Complex roof configurations can be found in many regions, though moving too far from the original form begins to dilute the vernacular style. This house successfully marries various roof forms — gables, hips, sheds and dormers of differing slopes — adding to its farmhouse aesthetic. Most American vernacular has a single dominant form and one or two minor appendages, but that in itself does not define the style, as illustrated here. 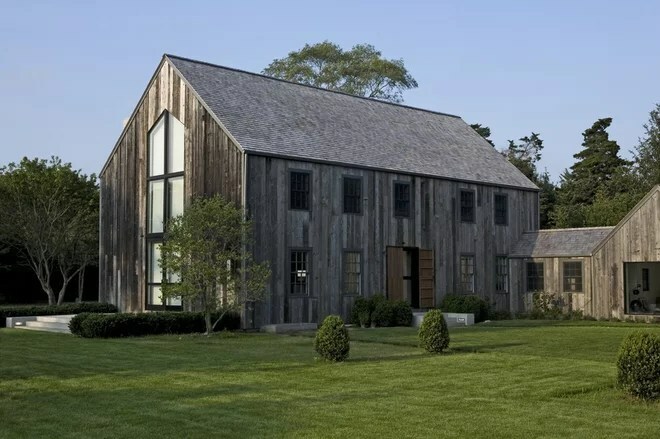 The bracketed ridge beams in the upper gabled elevations and barn-inspired garage doors maintain the farmhouse theme for this rambling abode. A massive stone chimney adds to the rustic style. Porch roofs. 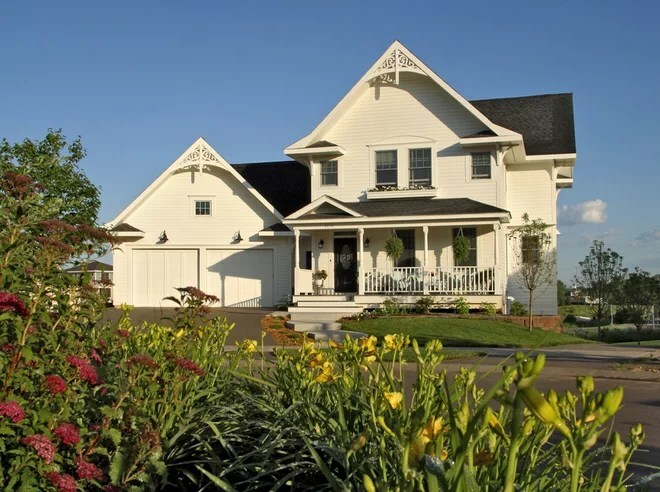 Roofs that cover the porch can be designed several ways. This one is considered continuous; the gable roof of the main body of the house descends in a single plane over its porch. The shed type is employed in the previous two examples, and an additive or drop type is illustrated in the first three examples. 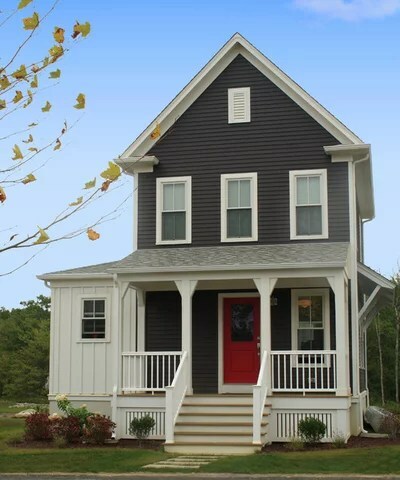 Porches are important elements and found in most American vernacular designs in some form. Confident massing. The primary focus of American vernacular is the form of the building. Each example here has a distinct shape that holds the design with confidence. 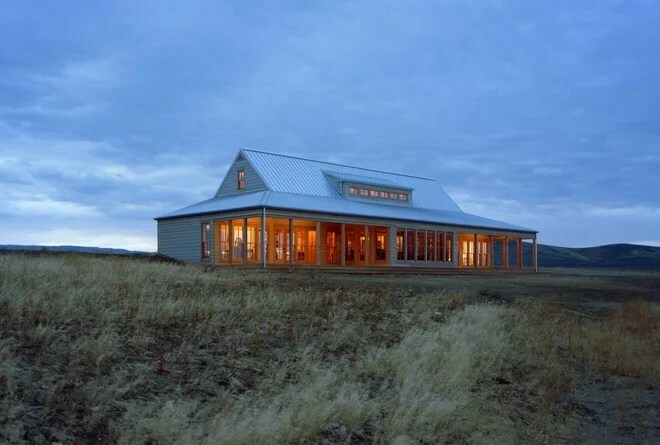 On this house the three-gabled roof forms are promoted elegantly and with minimal detail. The windows and doors are balanced in their respective elevations, while the roof and wall cladding are as simple and direct as possible. The overall impression is understated but strong. 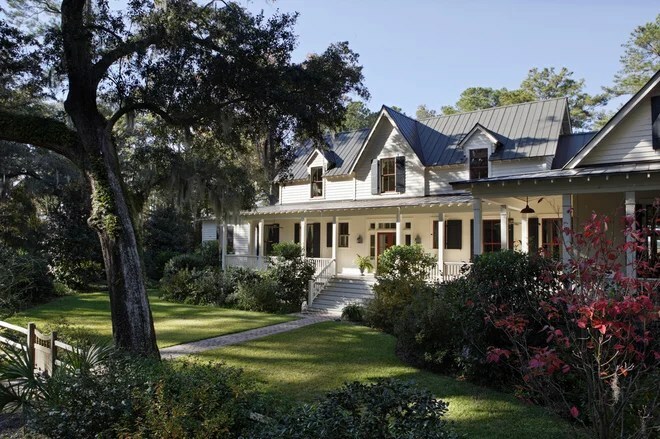 Farmhouses with whimsical elements. 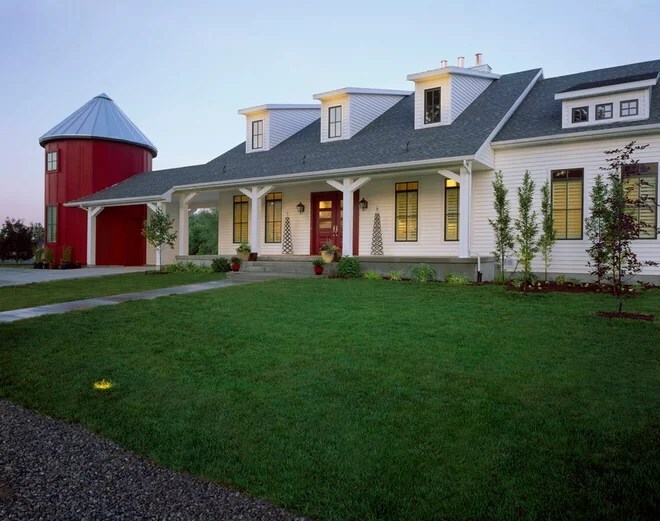 The cylindrical red silo attached to this farmhouse anchors its theme with delightful visual stimulation, punctuating the design. It stays traditional with a symmetrical central mass, then breaks from that tradition with its extending wings. Other than the simplified bracket detail of the porch posts, this design is direct and composed, which allows for the whimsical silo. Farmhouses with unifying materials. You will notice that with the exception of the last example below, these houses are clad almost entirely in one material each. This unifying technique adds to the simplicity that is important to the theme of the American vernacular style. The Central California coastal design here has board and batten siding, reminiscent of the ranch house, as exterior sheathing. Almost all of these houses have wood or simulated wood siding. 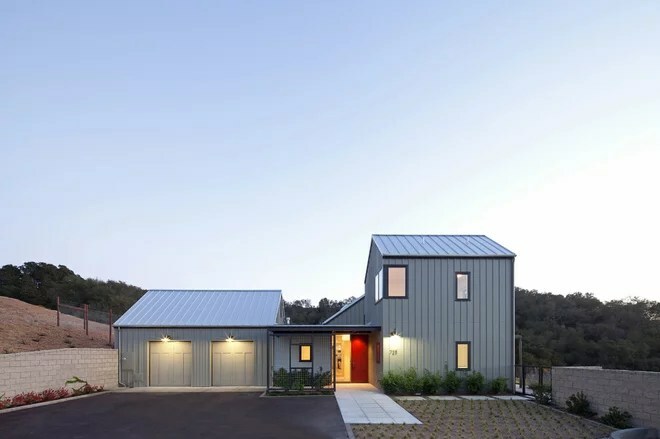 Roof shingles of wood or asphalt are used on some, but the standing-seam metal panel is a good fit for this style, as seen on this house and the first and fourth examples. 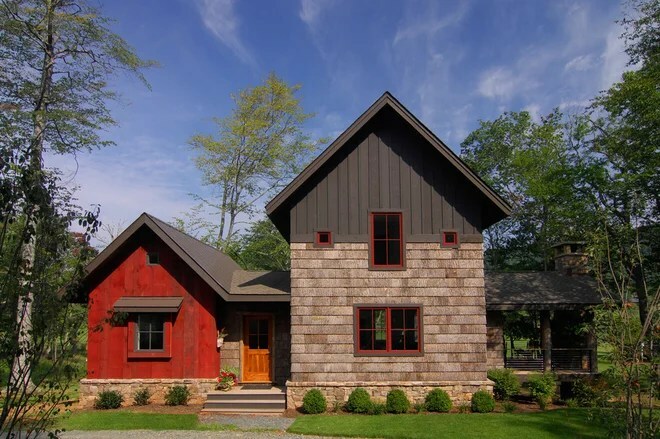 Farmhouses with strong but simple themes. This sophisticated house has a strong but simple form arranged in a series of gabled roofs with prominent chimneys. Vernacular houses respect indigenous design and translate them into contemporary manifestations that evoke the mood achieved by their precedents. Traditional and modern in one. At first glance the contemporary window arrangement that echoes the gabled end of this house conveys a modern aesthetic. Look more closely and you will see that the windows on the opposite side are traditional double-hung multipane types used in colonial houses. The American vernacular style successfully transcends decades and even centuries of architectural expression in a single context, which is rare for any type of design. 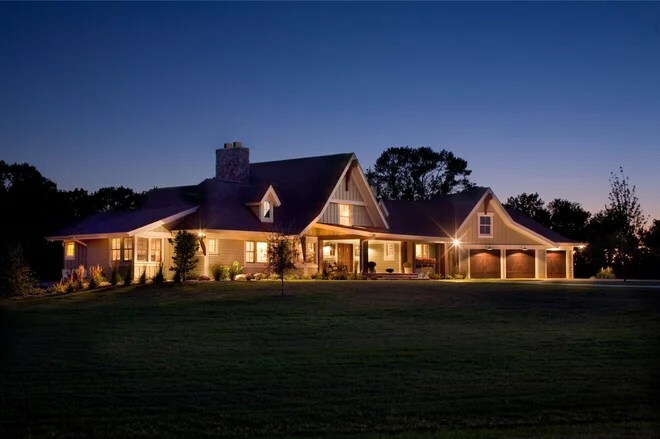 Straight forward farmhouse design. On this house, color and varying materials have been boldly played with to complete its theme while maintaining the important form of vernacular architecture. 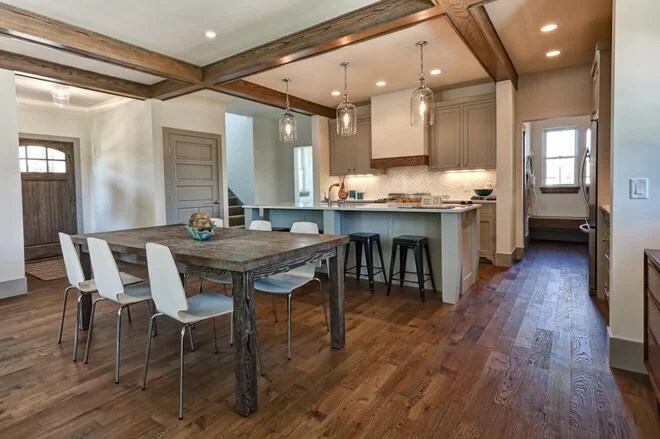 Stone and three types of wood combine in a seemingly complex arrangement, but have been executed in a straightforward fashion consistent with this style. 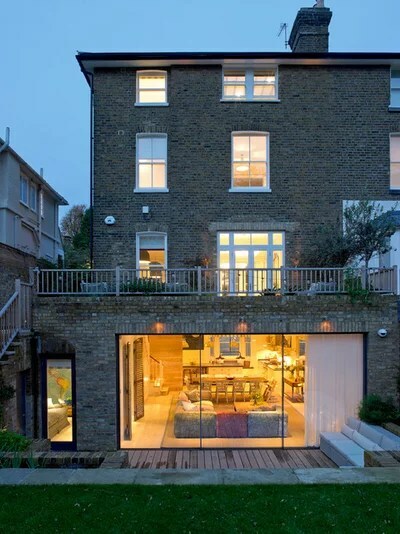 Even the shape and position of windows are varied to add interest and achieve balance. 5. 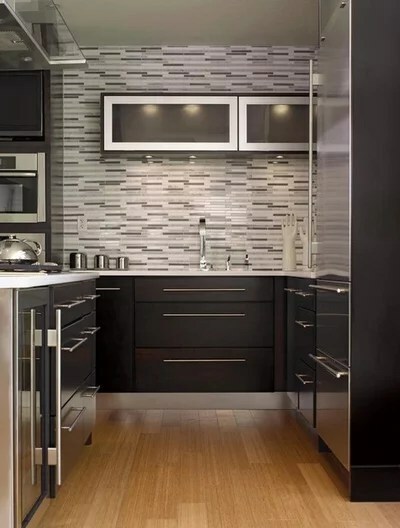 Install a designer backsplash.If you haven’t replaced your backsplash in more than a decade, chances are it’s too dated. A flashy glass mosaic or a creative blend of glass and tile can leave an impression on home buyers. Don’t forget about quality stone like marble and travertine either. When you’re deciding on a new color, the lighter, the better. 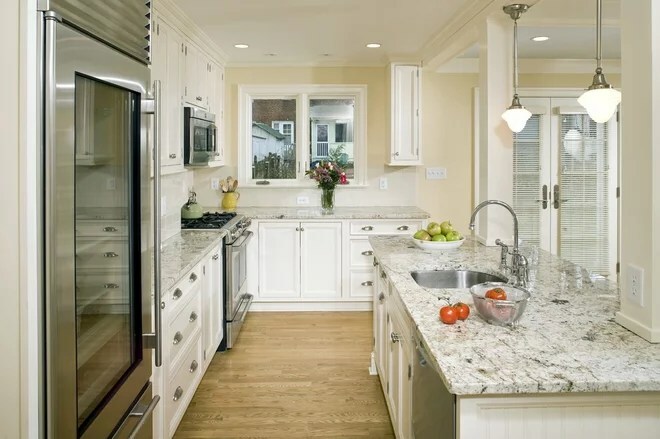 Remember, you want your kitchen to feel as open and expansive as possible. 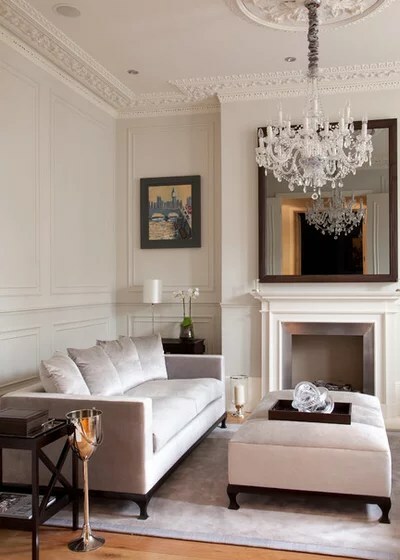 Grays are certainly en vogue, but off-whites, creams, beige’s and tan’s have broad appeal too. 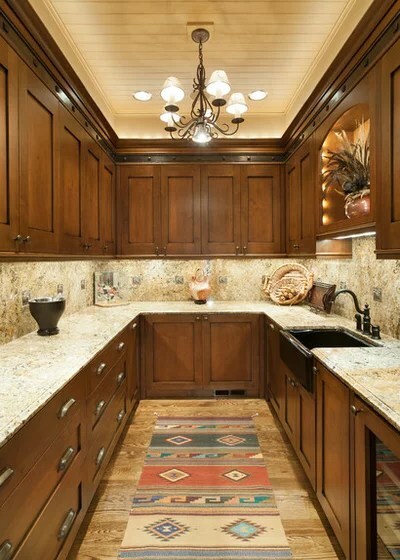 Choose a softer tone to offset dark cabinetry and furniture. 7. Boost and update the lighting.Lighting is a key feature in creating an open and inviting space that buyers will love. Swap out any dim or broken bulbs for new ones. If you have pendant lights or lamps, make sure they’re still in style. If not, invest in modern lighting fixtures that will have appeal in today’s housing market. Make it flow. 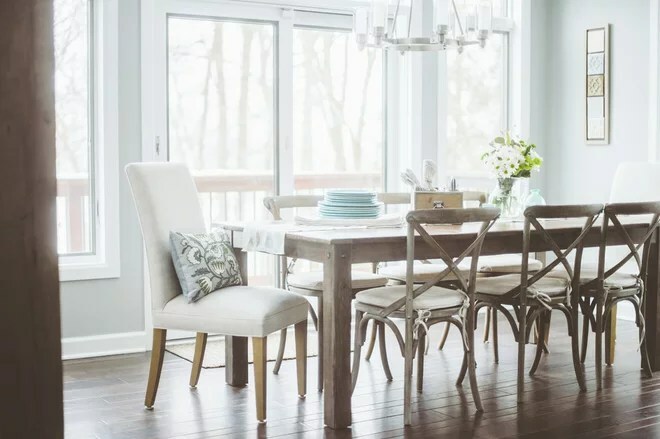 Tables, chairs and decor should feel natural and open, not cramped and closed. 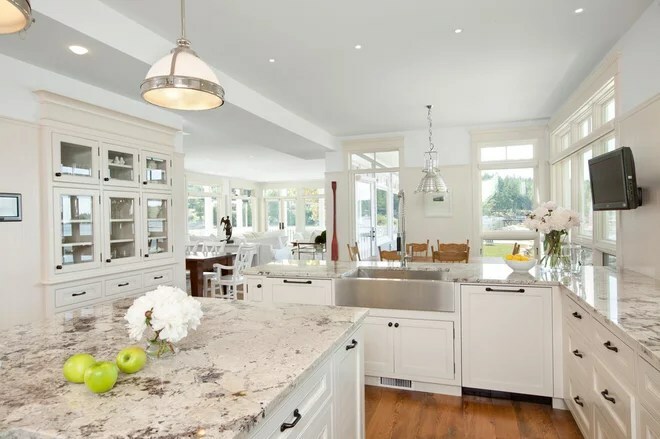 Consult with a real estate agent or interior designer if you need help reimaigning your layout to improve your kitchen’s flow.